Tis' the season ... the first few months after December lead a few of us into carnival season, gym season aka winin' season. There seems to be a gradual 3 part motivation. Carnival season starts the frenzy about all things carnival, particularly one's body. Gym season is the effort made to tone, get fit or add some bulk may it be for stamina or hot bodies. ... And then it all comes down to the two days on the road ... winin' time, my favorite yet in this 3 part series! Euphoria! Like the rest of you, my body is all that matters at this point. My P90x routine encourages me to eat protein in this Fat Shredder Phase 1. A high protein-based diet will help strengthen muscle while rapidly shedding fat from your body. I was thankful for Trinidad Carnival Diary's reminder about eating carbs in 'Carnival Fitness Tips,' a must read. If you need an Energy Booster, a balanced mix of carbohydrates and protein with a lower amount of fat will supply additional energy for performance. An Endurance Maximizer athletic diet consists of complex carbs, lean proteins, and lower fat with an emphasis on more carbohydrates. You'll need this combination of foods as fuel to get the most out of your final training block and truly get into the best shape of your life. Calorie Calculator - Daily Calorie Needs* .... looks like I better start counting calories! TIP: If you're up late burning the midnight oil, fill up on "free" foods. Eat celery, carrots, or, if you need a sodium fix, air-popped popcorn with a little salt. TIP: Green tea melts belly fat and lowers BMI (body mass index). TIPS: How To Take Body Tape Measurements - The tape should be pulled to where it is lying flat against the skin all the way around. 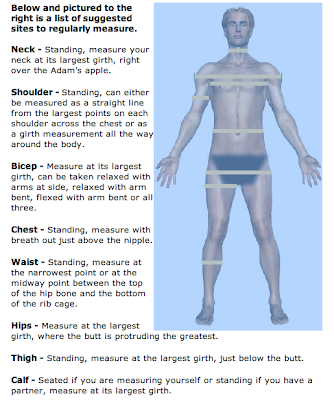 Like with taking skinfold measurements, your goal with body tape measurements is consistency. 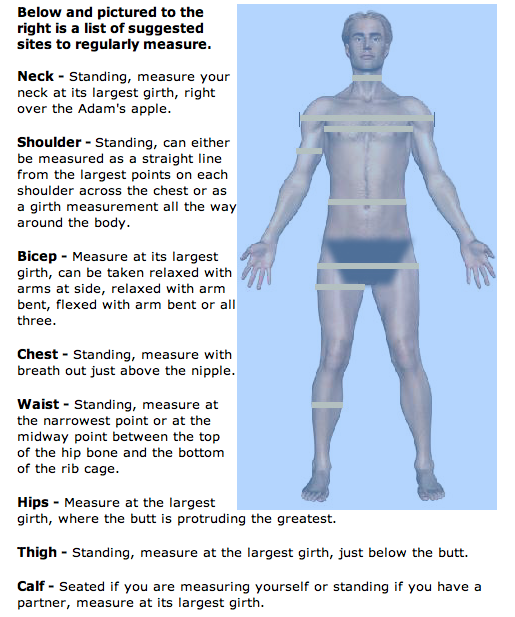 Take them the same every time you take them and you will get an accurate view of your progress with each body part.